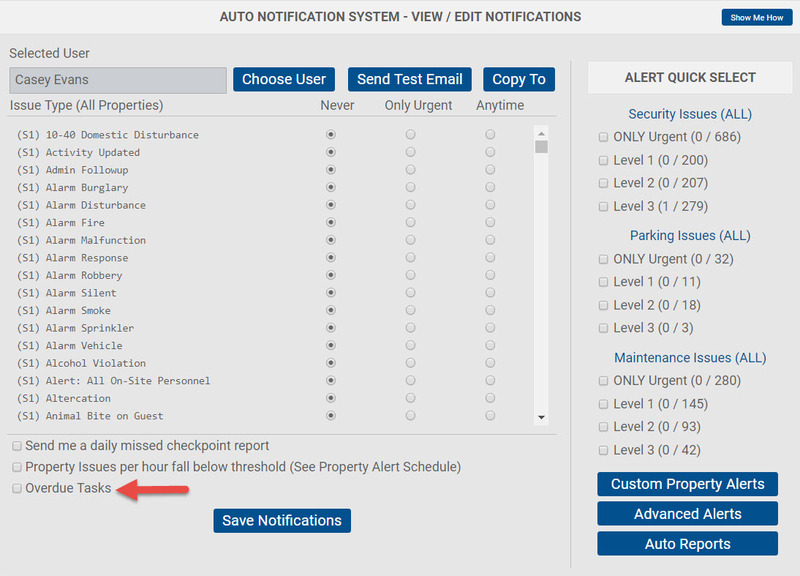 You can create alerts for yourself or your supervisors to be notified if an officer is late to a post by using a simple two step process utilizing the Task and Edit Notification features. Step 1.3: The Add New Task window will appear as pictured below. Step 1.5: Select an Issue Type. This is what will show up in the issue monitor, reports, etc. so make sure the issue type is a descriptive title of the task being assigned.Many choose to have the issue type mirror the Task name. NOTE: It is important to remember that all tasks must be created using an issue type. This can be done by either creating a new issue type or using an existing one. Step 1.6: Enter a Task Description. This is the note the officer will receive in the handheld and the note that will be shown in the DAR and Issue Monitor. Many choose to include a brief narrative of the basic start of shift or post orders that the officer is expected to begin with. Step 1.7: Select the Property Address. Step 1.8: You'll have the option to assign this task to a unit/suite or a location. This is not a required field but is handy to note if the office starts the shift at a specific location. Step 1.9: Select a Task Time. This is the time the task will be automatically sent to the property/handheld.In the case of setting up a task as an alert if an officer is late to a post you'll want to select the time as one hour prior to the start of shift or grace period.For example:if the start of shift in 8:00 am and the officer must be on post no later than 8:10 am the task time should be set as 7:10 am. Step 1.10: Select the Task Day(s) of Week. These are the days of the week in which the task will be sent to the property/handheld. Step 1.11: Select the Alert if Left Open field. 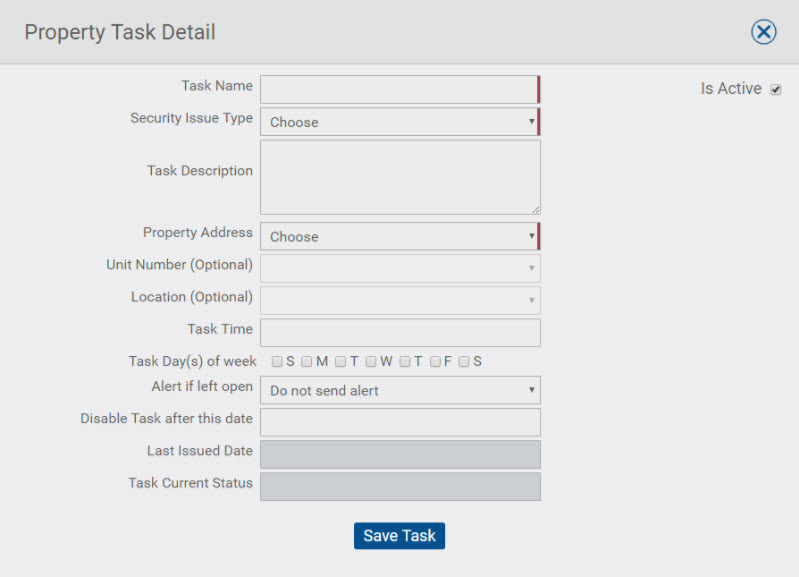 This allows certain users to be alerted when a task is overdue. In this example the alert is set to 1 hour.If the officer fails to log in and acknowledge the task waiting in the handheld device by 8:10 am your supervisors or dispatch will be notified that the officer failed to respond to the task and is late to their post. Step 1.12: Select a Disable Task After This Date (optional). This is not required. Selecting a date in this field will cancel this task after a certain date. This allows you to schedule a task to go out temporarily. Leaving this field blank will cause the task to run indefinitely. Step 1.13: Click the Add Task button and save. Step 2.1: Hover over the users tab, click Edit Notifications, then select the Admin, Supervisor or Dispatcher whom you would like to receive the alerts. Step 2.2: At the bottom of the screen there is a check box labeled Overdue Tasks as pictured below. Make sure the box is checked and click Save Notifications. Remember: Users that have this box checked under their notification settings, will receive overdue task alerts only for tasks that are selected to send alerts as set by the system administrator. This feature is best used for supervisor/managerial roles.